TAMPA, Fla., Aug. 11, 2011 (SEND2PRESS NEWSWIRE) — J.S. Cruise Line, the new world of travel, has been struggling to keep up in an economy that is under attack. However, a recent influx of cash may be just what the company needs to attract and retain new customers. Jejuan Sims, owner of J.S. Cruise Line, admits that this business has been struggling and at one point, he was ready to close its doors, but today he is confident that things are going to turn around. Sims’ new-found confidence is due to a small business loan of $250K that he was able to receive through an aged corporation. “With this new working capital, we are now ready to relaunch J.S. Cruise Line and begin helping our clients to plan unforgettable trips,” says Sims. Sims adds that he has a projected goal of 8 billion in future sales. He also hopes to help restore the U.S. economy by bringing jobs back to America and to develop three additional corporations. J.S. Cruise Line (J.S. Cruiseline, Inc.) is committed to being a leader in the travel industry. It provides clients with services like free 24-hour travel assistance, just like AAA members receive. The agents at J.S. Cruise Line take pride in creating trips that are specifically designed to meet their clients’ needs. Additionally, the company offers an incentive rewards program that helps clients to earn points and to get free cruise nights and hotel stays. Currently, Sabre Travel Solutions is working closely with J.S. Cruise Line to add a booking system to its web site. This will allow customers to conveniently book online, anytime, anywhere. Within the next 90 days or so, new features will include the ability to book flights, hotels, car rentals and more. Currently, J.S. Cruise Line is only accepting cruise reservations, and claims the lowest prices on the World Wide Web. For more information, visit: www.jstraveline.com . News issued by: J.S. Cruiseline, Inc. Original Keywords: Jejuan Sims, online travel booking site, Florida business, J.S. 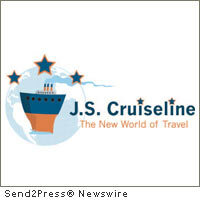 Cruiseline Inc, travel industry, cruise line booking, JS cruiseline, OLO J.S. Cruiseline, Inc. Tampa Florida TAMPA, Fla.
News Source: J.S. Cruiseline, Inc.
More from J.S. Cruiseline, Inc.
RSS News Feed for J.S. Cruiseline, Inc.
REFERENCES: Florida Business News, Jejuan Sims, online travel booking site, Florida business, J.S. Cruiseline Inc, travel industry, cruise line booking, JS cruiseline, OLO J.S. Cruiseline, Inc. Tampa Florida TAMPA, Fla.